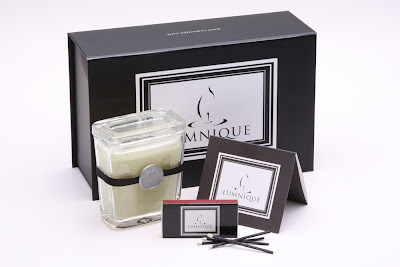 Ascending Butterfly: Luminique Personalized Scented Candles Review & Giveaway! Luminique Personalized Scented Candles Review & Giveaway! This giveaway is now CLOSED. Thanks so much to our wonderful sponsor Luminique! We look forward to working with you again! The winner is Terri142. Remember: There are great giveaways active on the upper right hand side of the page! I am a candle lover, and over the years I've purchased and received a fair share as gifts. Candles are used in different ways for many different moments. They light our birthday cakes, and mark milestones. They accompany us during a warm bath. They are left near the windows to help someone find their way home safely. They are lit in rememberance. They are lit to send our prayers to the heavens. They are used for scent to create a mood. Spas use them to help create a relaxing environment, and so do we at home. As much as I do love them, if you are on the receiving end of them often, they can become a bit boring after awhile. Where can you find a candle gift that is eco friendly, sophisticated and most importantly PERSONAL? If a CUSTOM candle with an intention is what you seek with a price that will not break the bank yet will still very much impress, look no furthur than Luminique! They offer a very simple, fun 5 step process to creating a gift you will be delighted to receive for your home (or altar, or meditation space) and that friends and family would be very touched to receive from you. Lumnique gives new meaning to the experience of giving and receiving a beautifully crafted candle. Unlike conventional, off-the-shelf candles, Lumnique's soy candles are highly personalized and exceptionally thoughtful. Each custom-designed by the customer especially for the unique personality and lifestyle of the recipient. Each Lumnique personalized candle is manufactured using a clean-burning soy candle wax blend and cotton wick, environmentally friendly color dyes, and natural essential fragrance oils that retain their scent while the candle burns. We do not house any premade candles in our inventory. All of our soy wax candles are created and poured individually after an order is placed. Creating your Candle - My Experience! Step 1 - When I sat down to design my candle, I had a lot on my mind. The year had already begun and thoughts of where I was at that particular point, where I wanted to be and the possibilities the year contained all played in my mind. Step 1 in designing the candle asks you to pick an intention. And this shouldn't be taken lightly whether this is for yourself or a gift. While there were various 'intentions' that spoke directly to me, I chose 'New Beginings' because that is what I want to create. I want to welcome new experiences both personally and professionally in my life and this selection is meant to 'inspire positive feelings about change and welcome a new direction'. Perfect! Step 2 - Select a color. I read through them all, and again various color choices appealed to me for different reasons including the 'wine' color, but ultimately I chose 'Red' which is 'Fire' - Representative of excitement; energy; strength; health; vitality; courage; power and willpower; enthusiasm; overcoming obstacles; passion; speed; strength; all elements of love throughout your life'. This greatly appealed to me because I wanted to overcome the obstacles that stand in the way to the 'New Begining' that I seek for myself. It's amazing how well both the 'intention' (Step 1) and 'color choice' (step 2) tied in to my particular wants and needs! I will admit I couldn't help but read every option with great care and enthusiasm. I haven't found myself this excited about personalizing a gift in quite awhile! Step 3 - This is a fun step, this is where you pick your fragrance preference. There are a ton of scents to choose from, I selected 'Frankincense and Myrrh - This warm, woody, balsamic aroma blends the mystical resins of frankincense and myrrh.' - It's a personal favorite of mine and I was very excited to see it included among the options! Step 4 - Personalize Your Candle - This is where you say who it is to and from and enter a personal message. This will appear in the customized certificate that is included in the box. Includes your Lumnique Personalized Candle and Customized Certificate. Each candle is delivered in a unique Lumnique gift box that includes the Candle, a Lumnique Matchbox and the Customized Certificate. I received the Deluxe Gift Set and found the packaging to be impressive, this is certainly the option I will choose when giving this set as a gift! When you light this candle, it's a very different experience, the customized certificate is a visual reminder of the intentions behind the candle, you literally feel like you are lighting the way to something. That you are creating something you want for self, in my case it is new beginings, you may choose to create an entirely different intention for yourself (like abundance for example! ), but the scent transports you, and between the scent, the packaging, and the certificate reminding you of the intention, it's a total sensory delight on a variety of levels. I can tell you no other candle out there can offer you this expeience! If candles are a favorite signature gift of yours to give, then UPGRADE immediately, because you truly will be remembered for giving this gift! And if you are lucky enough to be on the receiving end of this gift you will remember it always! Don't you just ♥ Luminique I know I do! Ƹ̵̡Ӝ̵̨̄Ʒ - How to Win: (1) You must be a PUBLIC follower of Ascending Butterfly to be eligible for this and all giveaways. Indicate in your entry that you follow (if your 'comment name/user id' differs from your profile id, please let me know what name you follow under) and (2) Visit Luminique- and customize a candle! Then come back here and tell us your intention, color, and scent choice, as your comment entry! You will not be ordering at this time, only following the first three steps in the process and sharing them here for your main entry. (3) You must also leave your email address somewhere in your comment. (You can format it this way for security, example: ascendingbutterfly AT mail host DOT com, If it is visible in your profile, just say so, that's OK!). Please follow the easy 1, 2, 3 steps to winning! This giveaway is open to USA residents who are 18 years of age or older. Im a public follower and made an anniversary candle in fire with strawberry fields scent! Abundance, Jade, and Green Tea and Lemon Grass scent. Follower! I am a gfc follower, and I would choose good luck, green and blueberry scent. I'm a follower and I would choose the Healing intention, Royal shade and Mango scent! I voted for you in the Blogger Choice Awards! I voted for your springtime nyc outfit in the Macy's fashion challenge! following tracy iglesias on twitter! Vote for Ascending butterfly on fuelmyblog! I would love to make a candle and my choice would be Love,Bliss(rose color) and Melon as a scent. Entered Helena de Natalio “Belen’ Shoulder Bag! I follow on GFC! My intention is Abundance; color choice is Sky; scent choice is Green Tea Lemongrass. I am a candle lover and these candles are awesome! (2) I choices are: Abundance, Jade, and Green Tea and Lemon Grass scent. I would choose the Friendship theme in Bliss (pink) with the Coconut Scent for my BFF. I follow your blog publicly with google friend connect. (Theresa)My intention is for an Anniversary, my color is Dove and the scent would be Orange Vanilla. I Subscribed to receive Ascending Butterfly emails. I follow. I picked anniversary, wine color, sandalwood. If I won I'd choose Christmas,Fire,cookies for Santa. Follow you publicly via GFC! and I chose a Protection Candle in Jade with a Pear Scent for my husband who is working out of town on a dangerous job! Picked all of them as my boys favorite things! i would get the abundance in fire with the green tea lemongrass scent. I follow your blog. I would choose the Peace intention, the Bliss color chip, and the Luscious Lilac scent. I sent a friend request to Luminique Personalized Scented Candles on Facebook. I joined your Spruz group. Mine would be in royal with the scent of FRANKINCENSE AND MYRRH.